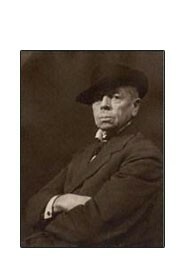 William Newzam Prior Nicholson was born on 5th February 1872 at No. 12 London Road (now South Parade), Newark, the son of William Newzam Nicholson (1816-1899) and his second wife Annie Elizabeth Prior. His father William was a prominent Newark businessman, who, following on from his father, Benjamin, prospered firstly as an ironmonger, going on to found a major agricultural engineering company. He was also elected Conservative MP for Newark from 1880-1885. Mayor of Newark in 1851, JP for Newark and chairman of the Magnus Grammar School board in 1871 – this was the illustrious background into which William was born. Cubley urged his father to allow William to leave school at sixteen and go to the Herkomer Art school in Bushey. 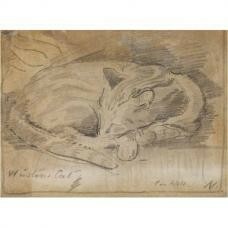 However, being too young to attend the ‘life drawing’ classes he returned to Newark after a year. Later that year he went to Paris to study at the Academy Julian, a new artistic group that the young William was probably too young to absorb, and he found the Louvre more fertile ground. He returned to Newark after a few months to work in his own studio. In 1893 he secretly married Mabel Pryde, whom he had met at the Herkomer’s Art School and they moved to Denham near London. With Mabel’s brother, James, also a painter, he formed a partnership to produce posters for the emerging advertising market, calling themselves “J & W Beggarstaff”. 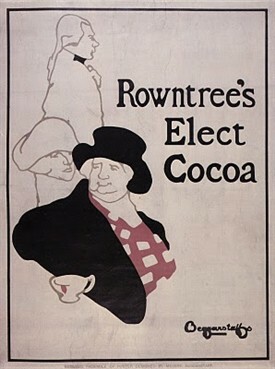 Although the Beggarstaffs did a poster for Rowntree’s Cocoa and for a Drury Lane production of Cinderella, the commercial possibilities of the partnership were never properly realised – which is not surprising considering that one of the most successful advertisements of the period had used Sir John Millais’s (1829–1896) popular painting Bubbles to advertise Pears soap. Nicholson decided to try his hand at woodcuts. Although he knew and admired the poster work of Toulouse-Lautrec and Bonnard, also shown at the Westminster Aquarium, his inspiration came from the simplified woodcuts in early nineteenth-century English pamphlets of popular tales or ballads sold by travelling salesmen. Deciding to enter the commemorative market, he produced a woodcut of the Prince of Wales’s Derby winner Persimmon. 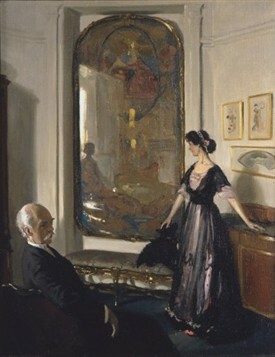 Shown at the Fine Art Society in 1896, it attracted the attention of James McNeill Whistler (1834–1903), whose reputation in London had been re-established by a retrospective exhibition of his Nocturnes and marine paintings at the Goupil Gallery in 1892. Whistler recommended the artist’s work to his friend the publisher William Heinemann, and Nicholson was commissioned to do a book cover with a racing theme, Mr. Blake of Newmarket. The publishing firm had only been going for six years and was eager for new projects, so William proposed a children’s alphabet, submitting two sample designs: ‘An Alphabet’ and ‘An Almanac of Twelve Sports’ were commissioned. 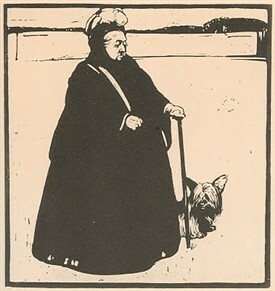 It was then that Nicholson produced his famous woodcut of Queen Victoria. Turned down by Heinemann, it was published by W E Henley in his monthly magazine. Despite adding to his ‘Twelve Portraits’ and ‘London Types’ , and winning a gold medal in Paris, the woodcuts were giving low financial rewards, as he now had a wife and three children to support. He turned to portraits responding to the potentially lucrative commissions for them. 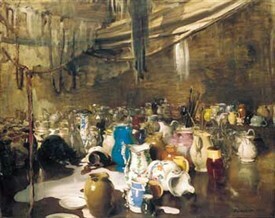 He was though still able to devote time to landscapes and still life. His perception of objects and particularly reflections and shadows makes his work come almost alive. His landscapes also use the tones of light and shadow, and in an article for ‘The Artist’ magazine in 1912, he wrote, “that the intensity of colour is affected by the strength of light or shadow that falls across it”. Portraits, however, made up almost a third of his overall working life. Well established by the First World War, he lost his wife Mabel to Spanish Flu in 1918, and his son Tony died of wounds in France. He remarried eighteen months later to Edith Stuart-Wortley. Nicholson declined membership of the Royal Academy in 1926, saying he wished to maintain his own independence. In 1928, he won a gold medal at the Olympics, in the Art category, for his ‘Almanac of Twelve Sports’ , that had been submitted without his knowledge. He travelled over to Denmark on the last possible day, to receive it. By 1933 he had separated from Edie and made his first journey to Spain. It was there that he met the author Marguerite Steen, who became his companion for the rest of his life. Still-lifes and landscapes dominated the rest of his artistic life – the 1930s producing a series of still-lifes of metal containers showing different degrees of reflection and highlights. He was knighted in 1936. In 1939 he suffered a stroke, and although seeming to recover, he gave up painting entirely by 1942, by which time the National Gallery gave a retrospective of his work. 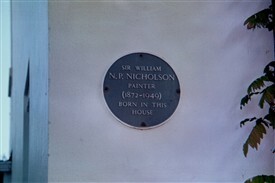 William Nicholson died on 16th May 1949. He is buried, with his parents, in Newark Cemetery. This page was added by Jill Campbell, Nalhs Newark on 09/02/2011.